The Scientific Inquiry into Hydraulic Fracturing is now calling for tenders to provide assessments of the economic impact and the social impact of hydraulic fracturing, should it be allowed. Two lots of tenders will be let for this tasks. This has been announced by inquiry chairperson, Justice Rachel Pepper. She says given the inquiry panel does not include an economist, and the only other relevant economic report is one commissioned by the petroleum industry lobby APPEA, “it is appropriate that the Inquiry seeks further independent economic modelling”. Judge Pepper does not say why there is no economist on the panel of the multi-million dollar inquiry, set up by the NT Government, and clearly not a social scientist either, although the inquiry is mostly about money and social impact. 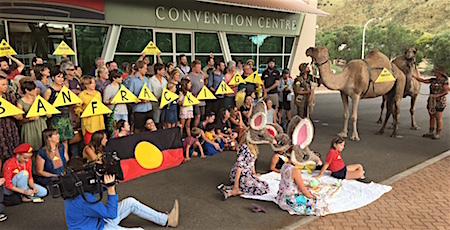 Justice Pepper also disclosed in a “community update” that the inquiry now will have three possible recommendations, not two: Fracking or no fracking in the NT, and fracking to be allowed only in the Beetaloo sub-basin only, which is south of Katherine. “The economic assessment will also look at the economic risks associated with the three scenarios, describing the actual and possible adverse impacts on and risks to the Northern Territory economy under the current regulatory regime,” she says. The update says the final report will be handed down to the Northern Territory Government by the end of the year.